Dresses of the best Italian brands worn by VIP and relatives of the couple at the ceremony, confetti (nuptial sugared almonds) of Sulmona, Amalfi lemons for the wedding cake, Aquazzurra shoes for bridesmaids and more … Italian style, once again, reconfirms as emblem of elegance and high class. Some days have already passed by the mediatic event that has intrigued the whole world and has glued millions of viewers to the television: everyone was ready to comment on every smallest detail of the ceremony and to tear up in front of this modern and beautiful fairytail of a young men – Harry, prince of the Windsor dynasty – and Meghan – a beautiful Afro-American actress. Despite their different social background, they fell in love and got married last May 19th, showing with infinite naturalness all their joy and emotion. Nothing was left to chance: every detail was organized in full respect of the rules imposed by the royal house; however, the royal strict protocol was nothing in front of the strong emotions that Harry and Meghan, with their loving eyes, aroused in the hearts of guests taking part to the ceremony: first of all, in the hearts of their relatives, as well as in those who, although at home, symbolically took part to this Royal Wedding seeing in Meghan the hero of our fairy tales, the “self-made woman with a normal life” who, suddenly, as if by magic, meets a prince, falls in love with him and marries him. Many things will be remembered of this Royal Wedding: the bride who almost crossed all the aisle of St. George Chapel alone – Prince Charles accompanied her only in the last part of the way -, the bridegroom who was visibly moved on the altar, the absence of the bride’s relatives, made exception for her mother and the choice to enrich the wedding day with exclusive Made in Italy details! Yes, that’s right! 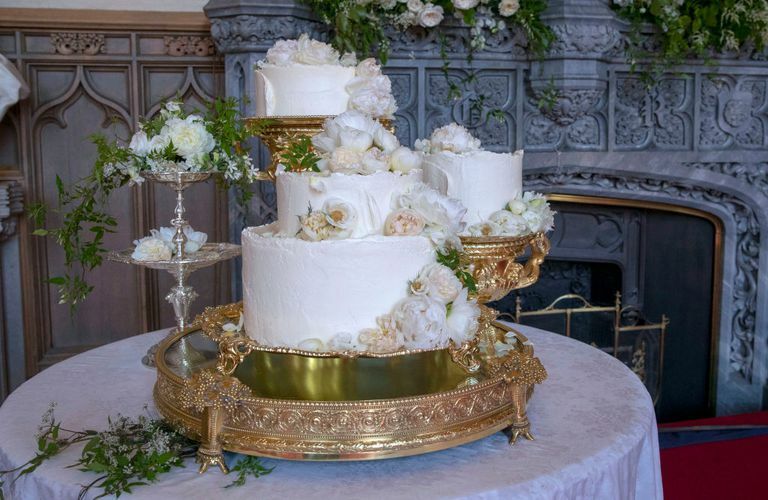 Although there wasn’t any famous Italian person participating in this royal wedding, “Made in Italy” had been the guest character of this event, from the wedding cake to the “confetti”, from the clothes worn by the movie and sport celebrities in occasion of the Royal ceremony to the shoes of Meghan’ maidens. 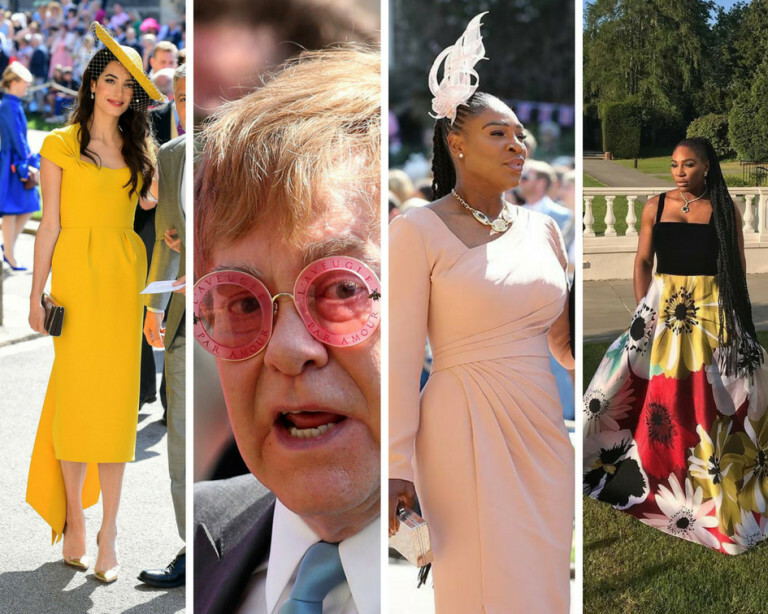 Even in a discreet way, Italy and its treasures were guests of honour at the Royal Wedding. The nuptial sugared almonds (confetti) arrived from Italy, precisely from Sulmona, specially made for the English Crown by Pelino company, which since 1783, has been producing confetti according to the ancient recipe, that means without the use of flour or starch, but only with sugar and Avola almonds. The choice of the royal couple to contact Pelino company for the realization of sugared almonds to offer at the party were not accidental. In fact before them, Carlo and Diana and subsequently William and Kate too chose Pelino for the production of these wedding sweets. Confetti, however, weren’t the only typically Made in Italy “sweet”attending Harry and Meghan’s Royal Wedding. Another 100% Italian ingredient was the protagonist of the wedding cake: we are talking about the Amalfi lemons. 200 lemons had been used, all of them coming from the charming town of Naples, carefully selected for the creation of a wonderful cake made with lemon and elderberry, as expressly requested by the bride. Also, a lot of Made in Italy for what concerns outfits. Many cinema and sport celebrities, but also some members of the royal family have shown off precious creations of famous Italian stylists both in the church and at the party offered by the Queen. Amal Alamuddin Clooney, wife of the famous and charming actor George Clooney choose a yellow total look by Stella McCartney, but at the feet she wore a creation by Gianvito Rossi, with transparent inserts. Gucci glasses with the inscription “Blind by love” on the singer Elton John. Meanwhile, Serena Williams accompanied by her husband choose a dress by Atelier Versace draped on the front, that she wore for the church ceremony. At the party, the famous tennis player honoured Valentino with a sumptuous dress provided with a wide floral skirt. Look 100% Made in Italy also for Kitty Spencer, nephew of the departed Princess Diana, who at the Royal Wedding wore a green dress with hand-painted flowers by Dolce & Gabbana. Among the many Made in Italy creations at the royal wedding, we can must mention a brand that among all, has distinguished itself for being on the feet of Meghan’s bridesmaids: the new Duchess of Sussex loves this brand very much and she strongly requested it for the occasion. We are talking about Aquazzurra brand, created by the Colombian designer Edgardo Osorio and produced in Italy, at the Missouri footwear factory in Monturano (Fermo), in the Marche region. 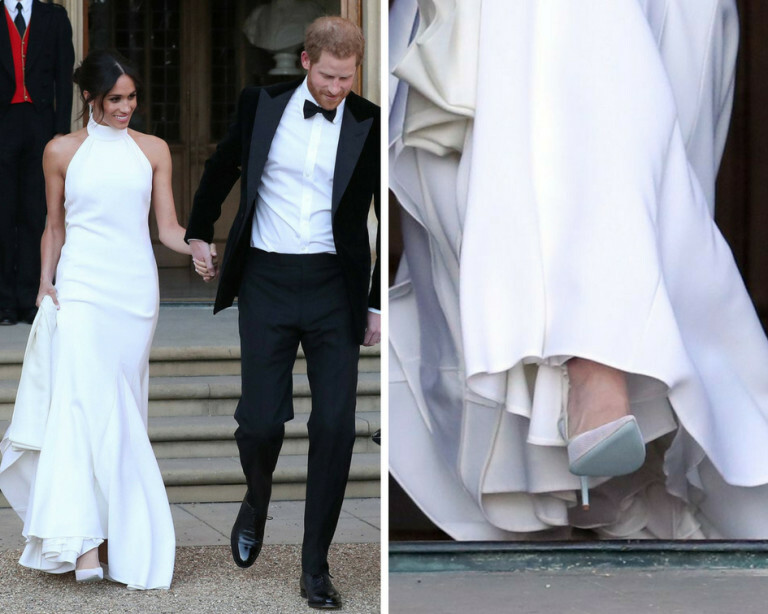 Both Princess Charlotte, daughter of Kate and William, and the other four bridesmaids wore the same model of shoes made in pearly white nappa, ton sur tone with the dress and embellished with handmade leather bows. 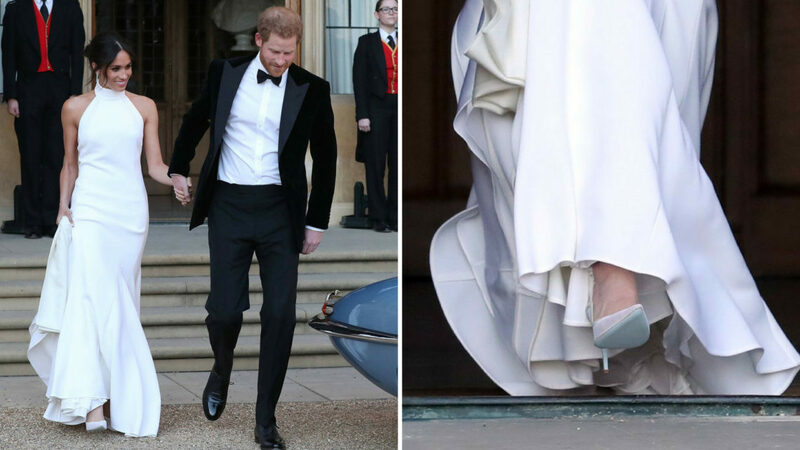 Each pair of shoes had been personalized with the initials of the girl and the date of the wedding, as expressly desired by Meghan. The bridesmaids were not the only ones to wear Aquazzurra shoes at the wedding. Also Mrs. Doria Ragland, Meghan’s mum, chose the brand of Edgardo Osorio for her shoes and Meghan herself, at the party, showed off a pair of Aquazzurra with blue sole. Once again, Made in Italy has confirmed as guarantee of value, quality and elegance in the world. From food to clothes, passing through shoes, the certified Italian product has filled our hearts with pride and satisfaction and for all those who, like us at Gleni, daily work to promote Made in Italy in the world, these appreciations are the lifeblood of our daily job. I looooved Meghan’s dress! She’s so classy and elegant! I loved Meghan’s dress too. Both of them! Thank you for sharing your opinion! Don’t forget to join our mailing list!